As I am a professional musician myself, I can share with you what I have lived through. I can only teach what I myself embody. Embodiment of function improves function. 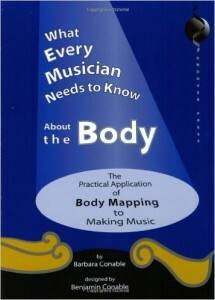 At music conservatories and in instrumental tuition everywhere there is a great need for deeper understanding of the body. So-called “anatomical” cues , e.g. “push with the diaphragm” are not only incorrect, they make people try to do things that are not really possible, working hard in the wrong places. ‘Natural’ musicians, dancers and actors are often blessed with innately good alignment. Their bodies allow for better movement and coordination at a higher level. This leaves them with personal images of certain movements. As these images cannot be transferred clearly to the body, one must be a “believer” and search for the unattainable. It is my goal to spread basic understanding and experience of anatomy and function to the musical world, but also to actors, dancers and the general public. My advice is to take Music, Mind and Body first, before delving into details on anatomy. Please also have a look at workshops “for all”: these themes may come up in every workshop or in personal coaching.